Cloud B is offering our readers a giveaway of a Tranquil Turtle, a value of $47.95. 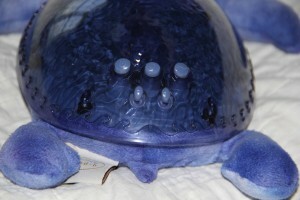 Cloud B’s Tranquil Turtle is a multi-sensory nighttime toy to help your family fall asleep. Cloud B, a play on the Cloud 9 phrase, was founded in 2002 by co-founders Linda Suh, a mother of two, and Jeff Johnson, a designing extraordinaire. It was their intent to produce a line of products that would help children sleep. In an effort to spread sleep love, the company has been involved with charity projects, including The Great Sprouts Tuck-In program, which provides pajamas and books for children in need, and Max’s Love Project, which helps provide Twilight Turtles for children fighting cancer. As someone whose mother was a strong children’s literacy advocate and died of cancer, these are both charities I can get behind. The Tranquil Turtle is as adorable as it is soothing. The Tranquil Turtle, having won both the 2013 Toy of the Year (TOTY) Award and the 2012 Parenting Toy of the Year, combines a multi-sensory approach to helping your family go to sleep. 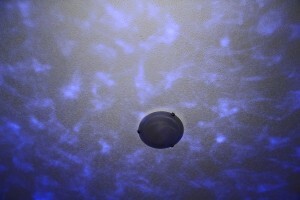 Subtle lights add an effect much like that of waves under the water, projecting the illusion onto the ceiling and walls. Buttons give you options for no sound, waves, or music along with waves. Both the light level and volume can be adjusted to accommodate different needs. A 23-minute timer automatically shuts off the Tranquil Turtle, preserving battery life. 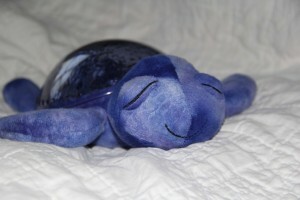 The Tranquil Turtle comes in two colors, Aqua and Ocean. Buttons are easily accessible to change the light and sounds. Cloud B has been making products for families since 2002. We had considered purchasing a similar product of theirs, the Twilight Turtle, in the past. After all, having stars projected onto the ceiling sounds like a cool idea. The products always seem to be marketed as being a way to get your child to sleep alone, though. Having a family bed, we had no need to try something to try to get our children to sleep on their own. We opted to pass on the product at that time. I wasn’t certain what to expect with the Tranquil Turtle, but my children were open to reviewing it. I have to say I was pleasantly surprised. The first night, after reading from our book, we turned off the light and turned on the Tranquil Turtle. My husband cried out, “What’s that?” — to which my children happily explained that it was the turtle. While difficult to capture without a flash, the waves have no problem projecting across the room. The wave-like projections had no problem reaching the ceiling and walls, despite a large bedroom. The motion, which can be turned off if you like, was almost hypnotic. It’s difficult to watch without feeling your eyes want to close. While I am not a fan of the music option, the waves are a pleasant white noise background. I find them to be very soothing. The second night, the kids had the turtle ready before we even got in bed. We read and then turned off the lights. When the turtle was turned on, my husband asked if this was going to be a new ritual. He was asleep shortly. The next day, he happened to lie down on the bed, and one of the kids turned on the turtle and set it next to him. He was out like a light. That night, he was the one to ask where the turtle was as we were getting the kids ready for bed. For your own chance to win a Tranquil Turtle from Cloud B, enter by leaving a comment and using our Rafflecopter system below. Contest is open to residents of the US only. MANDATORY ENTRY: Simply enter your name and email address in the Rafflecopter entry system for your entry to count. Contest closes 7/27 at 11:59 p.m. Eastern Time. Mandy O’Brien is an unschooling mom of four. She’s an avid reader and self-proclaimed research fanatic. She shares a glimpse into her life atLiving Peacefully with Children, where she writes about various natural parenting subjects. She also shares her view on books at Novel Obsession and is working to help parents identify with and normalize attachment parenting through Attachment Parents Get Real. Plush Pillow – Ladybug! It would be perfect for my daughter! My friend is due any day now, this would be great for her! The Twinkles To Go Oct is another great product from Cloud B. My family travels alot (both my husband and I’s family lives 400 miles away), a light like this would be most beneficial for our little guy. Our son Ronnie would love this light soother. We LOVE the Tranquil Turtle! Especially the aqua. My friends baby would LOVE this! I also like the Sleep Sheep. I would I’ve been wanting one for some time now. I love plushies with extras. My daughter has the lady bug scented pillow and loves it. My son loves his cloud b lamb lovey too.